Experiences shape us. It shapes our lives. It changes our perspectives. It sometimes makes us or breaks us. Regardless, it is always a learning opportunity. Experiences shape us. It shapes our lives. It changes our perspectives. It sometimes makes us or breaks us. Regardless, it is always a learning opportunity. One of the most grueling experiences comes from building your own business and watching it as it grows, stalls, or even runs into the ground. Either way, the experience is beneficial, and the lessons learned are priceless. So when venturing into the unknown as an entrepreneur, we learn lessons that are more intriguing than any other experience. In 2017, we’re seeing a massive problem amongst millennials and their career progression; to be more specific, their satisfaction and the length of their commitment to an organization. They simply aren’t happy working where they are right now. They want more meaningfulness in their work. 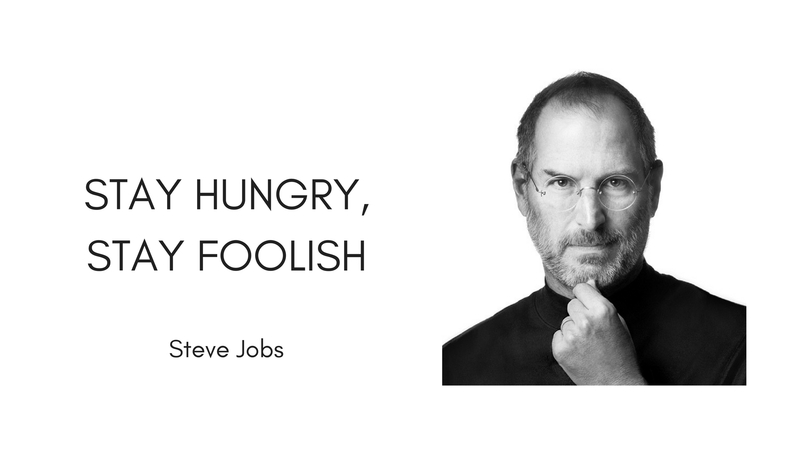 If any entrepreneur went through this before us, it would definitely be Steve Jobs, founder and CEO of Apple Inc. A college dropout after just 6 months, he sought to find his purpose in life. Not only did he find his purpose, he envisioned products which were inconceivable by the human mind at that point, to say the least. Now let’s look at the problem through a small comparison. If we compare his life to the millennials, most millennials study for 2 to 3 decades’ worth of time and some realize they just don’t know how to be happy. Jobs on the other hand realized his mistakes and rather sought to search for life skills that only interested him. He decided that he would not waste his parents’ income on an expensive university. He sought to find what he loved doing as early as he could. Now that is not to say that a proper education is not required. A college degree is a must have if anybody wants a good career. But we need to look beyond the norms of our society in our journey, whether it’s learning from Steve Job’s life or simply applying some thought to our own lives. Schools can help a child know what they truly want to do with their life. If grownups can’t figure life out, then imagine how a child can do so with little or no experience. Sometimes we need people in educational institutions to be backed with solid psychoanalysis for proper guidance. Sometimes families around the world don’t understand the importance of letting their children dream just a bit bigger. Entrepreneurship allows you the ability to look far beyond the norms of society, and reach higher to turn your dreams into reality. Because if you yourself don’t look at the world through your glasses, then no one will. Your vision for the world and how you contribute to it is more important than the next person. As entrepreneurs, we get the golden ticket to pursue whatever we set our mind to; however, we often forget to pursue our happiness. It is only through the pursuit of our happiness, our passions, and our perseverance that we achieve a state which may be considered as success. The biggest lesson that entrepreneurship taught me is that you should do you. You need to find what you like and not let others tell you what to do. Only then will you find true happiness… and in business, that’s success! Ayrin Islam, based in Montreal, Canada, is the female co-founder and CEO of ringID, a social networking platform with voice and video calls, instant messaging, multimedia sharing, secret chat, and more. With a keen interest in cutting-edge technology and a degree in commerce, she started her first business fresh out of university. Ayrin quickly established herself as the woman in charge of several technology businesses, including telecommunications, IT, colocation services and IP based communication software. In addition to being a tech entrepreneur, Ayrin also has experience as a successful corporate leader: Just four years after finishing her degree, she started serving as the chairwoman of Bangladesh's largest data center service provider, as well as the CEO and managing director of another telecoms firm.